Davao City is the most popular city on Mindanao Island for tourists who want to explore the southern Philippines, and there's no wonder why. There's ton of fresh durian, fresh watermelon, fresh tuna, beautiful beaches, vibrant night life, shopping malls, and many other fun activities! #1 - Green Windows Dormitel: You're in for a surprise at the very friendly price of Green Windows Dormitel -- located at FTC Tower, 1034 Mount Apo Street, Davao City. Their rooms and toilet are ultra tidy, beds are so comfy, on top of serving free breakfast and drinks. This wonderful dormitel is also swell because of its nice address, that is an easy commute to the scenic spots in Davao. #2 - Ritz Hotel at Garden Oases: Get happiness blitz from the Ritz Hotel -- situated at Porras Street, Barangay Obrero, Davao City. Sweat it out at their basketball court, or dip into their cool swimming pool; in addition to that, have a stroll in their stunning garden, plus have some good food, etc. Huge rooms, perfect beds, warm and friendly staff, all these await you there -- you will thus be a satisfied customer. #3 - Ponce Suites Gallery Hotel: There's every moment to relish at Ponce Suites Gallery Hotel -- positioned at Corner Roads 3 and 4, Dona Vicenta Village, Bajada, Davao City. If you are very keen with art, you will especially love this hotel's paintings, along with other artworks on each floor. Their manager and staff are very accommodating, too, so you'll feel right at home. All these and more, as you open their door for an excellent vacation, that you will absolutely savor. #4 - Park Inn by Radisson Davao: Guests can't help smiling at Park Inn by Radisson Davao -- which is spot on, via Asian Highway 26, J.P. Laurel Avenue, Davao City. This hotel has a breathtaking interior, delectable breakfast buffet, commendable amenities, super hospitable staff -- along with its easy accessibility to SM Lanang mall, within the vicinity. So come on and check into Park Inn -- where life is oozing amazing. #5 - Microtel Inn by Wyndham Davao: Limitless joy, there's no telling, is always happening at Microtel Inn by Wyndham Davao -- occupying Damosa Gateway Complex, Mamay Road, Lanang, Davao City. 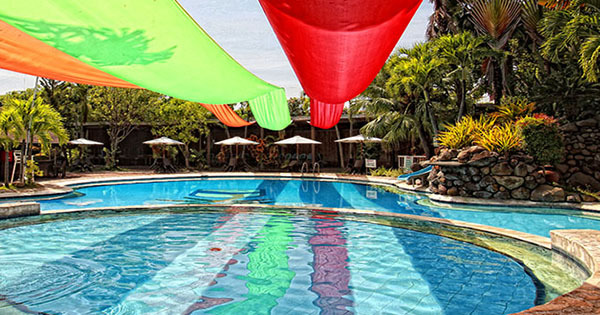 This superb inn is within easy reach from the airport, as well as SM, Ayala mall, etc. Also, guests can expect exceptional customer service, delicious breakfast, relaxing rooms, and the convenience of going around the city -- through the prolific taxi's just across Microtel Inn.